How do I upgrade or downgrade my subscription plan? How to change the subscription type your plan is using. 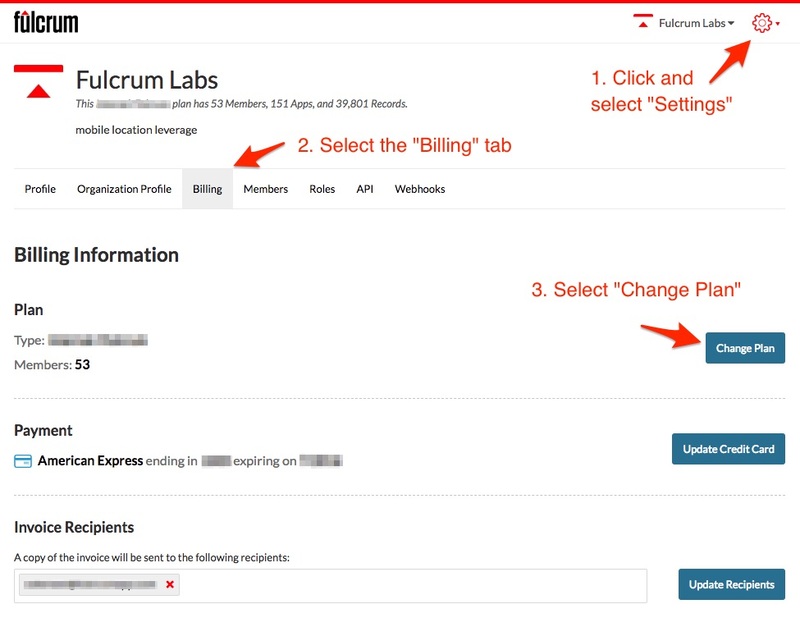 If you already have an existing Fulcrum subscription and would like to upgrade or downgrade your subscription plan, go to the Settings page and select the Billing tab. Towards the top of the page, click Change Subscription, then you’ll be able to select the available plans to switch to. Note: Some plans may show as unavailable, meaning your account is currently using features not available on those plans. The current features that are limited to higher plans will be highlighted at the top of the page. You’ll have to modify your apps and data to fit the features available in the lower plan tier. Note: If you manage multiple Fulcrum plans, you will need to make sure that you are currently accessing the plan for which you wish to change the plan level. This can be done by selecting the plan from the plan drop-down located in the upper-right part of the page.